The Conservation Federation of Missouri is not a branch of state government or an entity of a public agency. CFM is a private organization made up of thousands of Missourians who work together to better our natural resources and represent Missouri’s citizen conservationists. 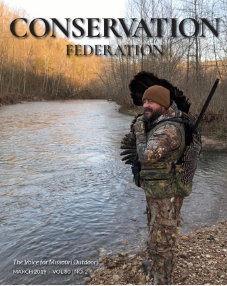 Actively involved in state and national issues that relate to conservation, the Federation has long been a prominent and effective voice before the Missouri general assembly, the Missouri Department of Conservation and the Missouri Department of Natural Resources.